This review has been a long time coming (my first visit was in January), and since Bus Stop opened almost every Brighton foodie has raved about them, either on their blog or social media, so excuse me, I must run, the bandwagon’s here and I’m getting on. 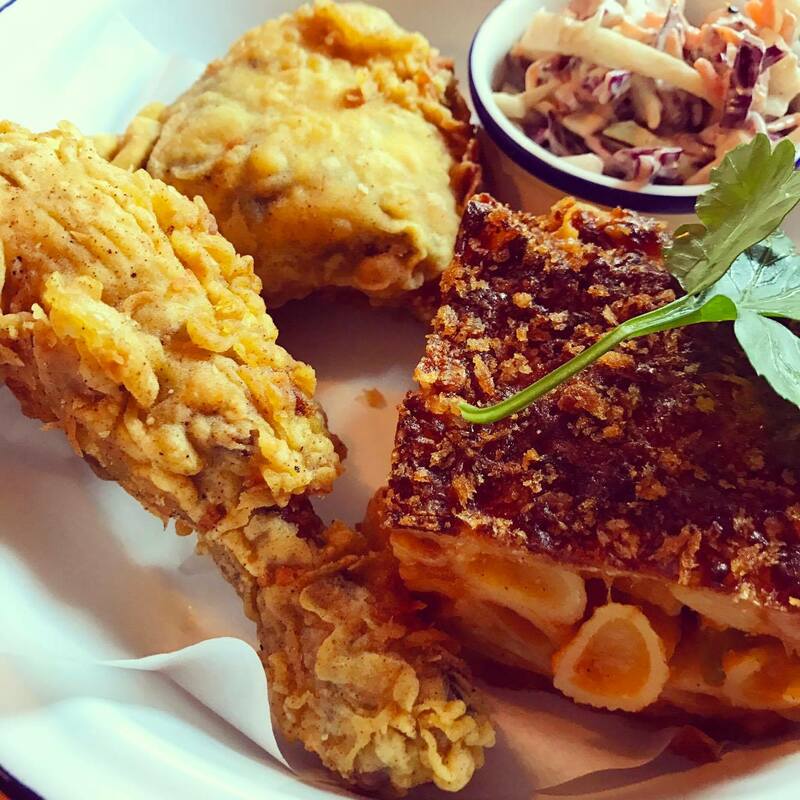 I can’t remember the last time I ate somewhere three times in one week, I’m not even sure it’s ever even happened… They had me at fried chicken with mac pie and sealed the deal with their proximity to my office. I went in for an impromptu lunch one day, went back the next to check I hadn’t imagined things, and then again at the weekend because it was all I could think about. 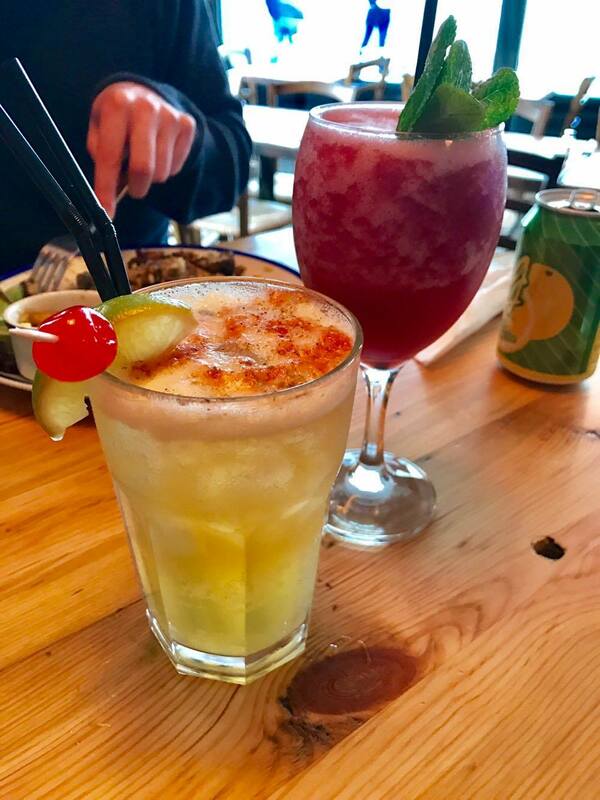 Back a Yard – I believe this is the reincarnation of Taste of the tropics, but in a little shack on Lewes Road. I’ve not been, all feedback welcome in the comments section. Likkle More – People RAVE about this place, it’s a little shack around the back of Hove Tesco, it’s on my to-do list. 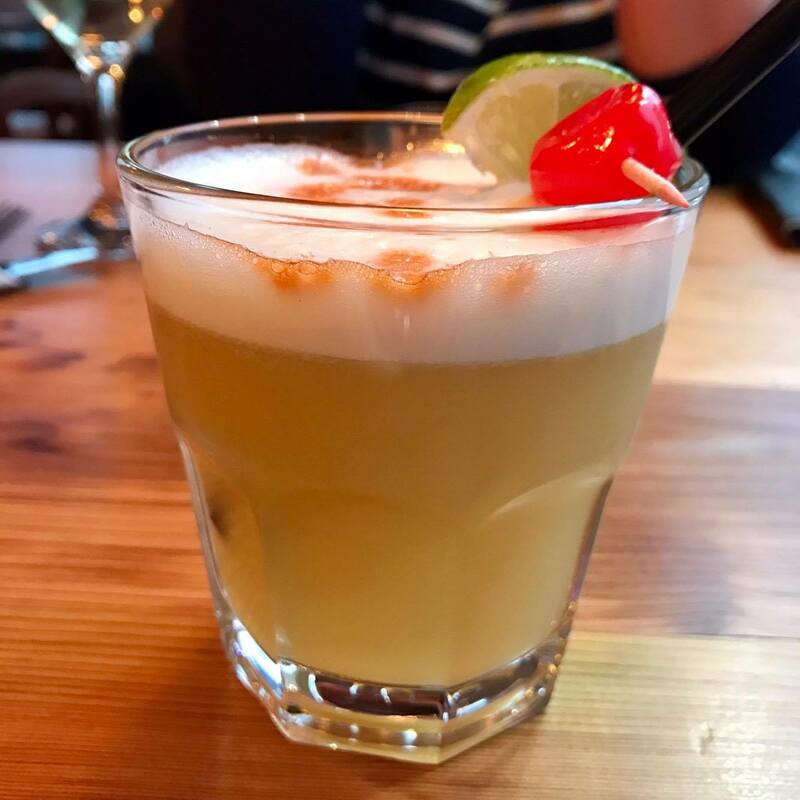 The restaurant seats about 25, at a push, is decorated with a gallery wall of photos of the owner’s family and ‘island life’, and has a huge, LED-lit bar at the back, with a playlist of reggae setting the mood, perfectly. 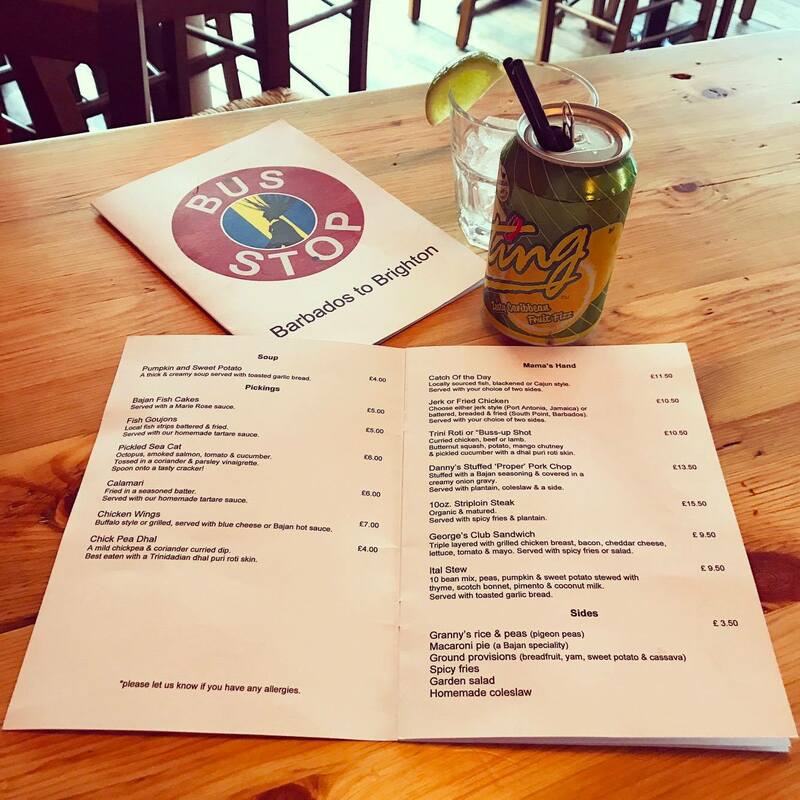 The cocktails are definitely a selling point for Bus Stop – tropical, boozy and right up my street. 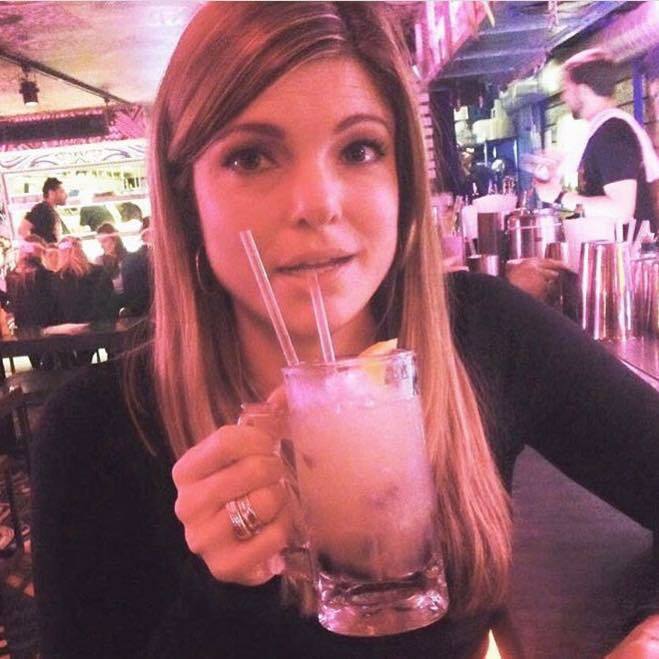 One of my earlier childhood memories is my Dad letting me have a sip of his Piña Colada every night before dinner, on holiday in Barbados (god I must’ve been about 7, social services would be called now, surely?!) and they’re still my summer time drink of choice to this day. 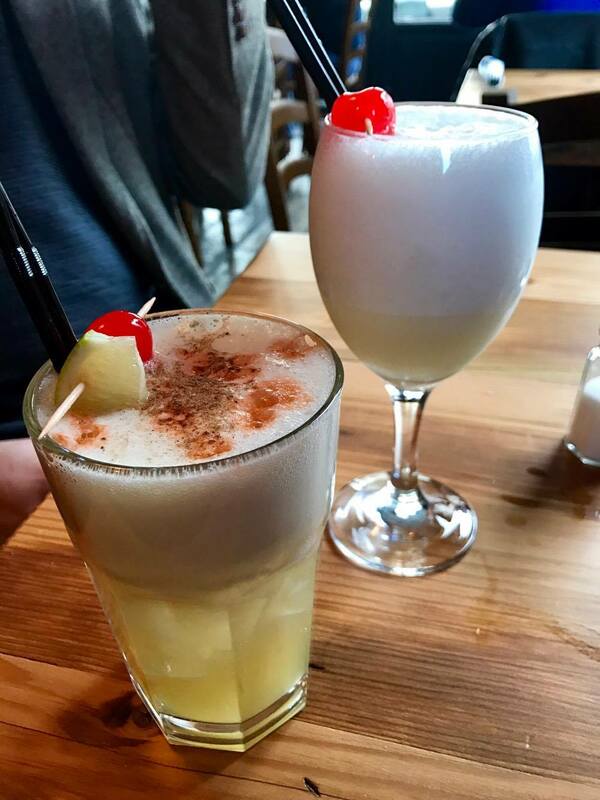 The rum punch and daiquiris are well worth ordering too. The Bajan fishcakes (£5) were probably my least favourite of everything I’ve eaten at Bus Stop, not because they were bad, just not what I expected. They reminded me of Jamaican dumplings, which I love, just little to no hint of fish, or spice or much complexity of flavour at all. 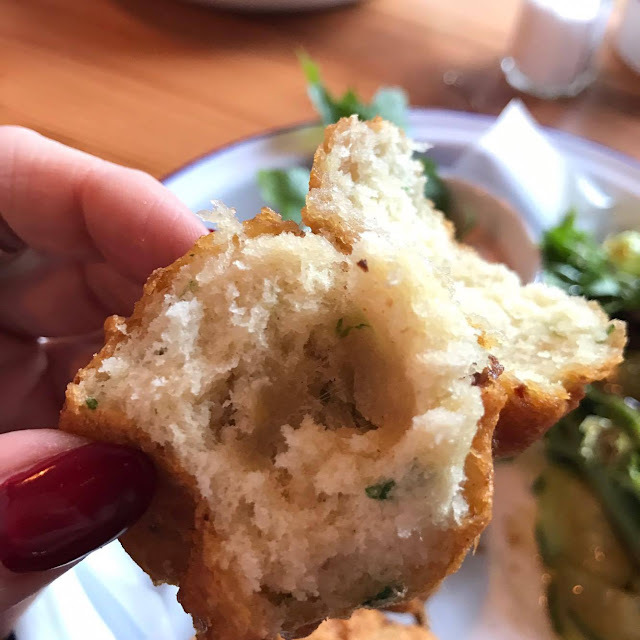 Phew – that’s genuinely my only (tiny) gripe in the five meals I’ve eaten there. The calamari (£6), on the other hand, was everything I wanted it to be. 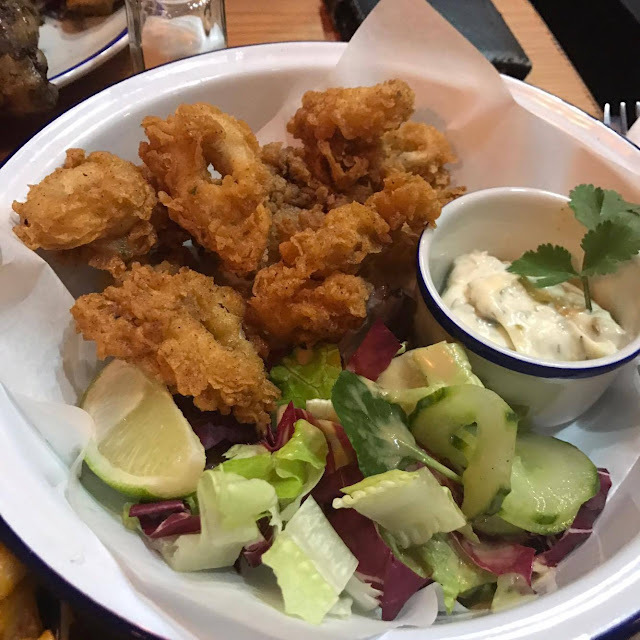 A generous portion size, and an inner that had remained bouncy, despite a blast in the deep fat fryer long enough for the outer to be as crispy and delicious as *that* salt & pepper squid at Giggling Squid (review here). Hands down the best swordfish (£11.50 with a choice of two sides) I have ever had. Biiiit of a raised eyebrow from me about it being ‘catch of the day’ and locally sourced, but it was so, SO good that I immediately forgot this as soon as I tasted it. 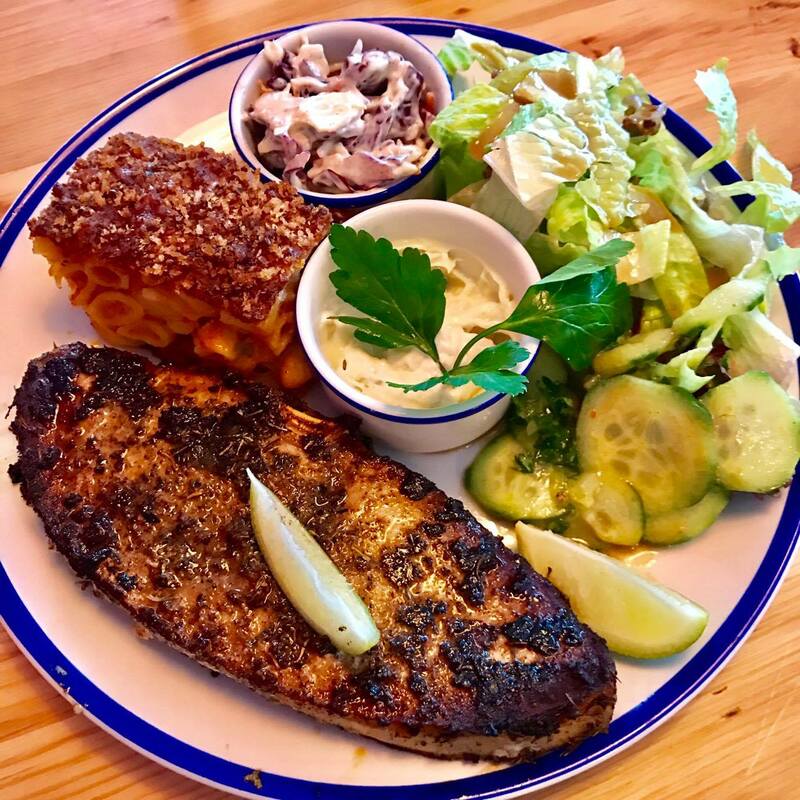 Swordfish tends to have more of a firm and meaty texture to it, and withstands bbqing better than most fish, so whilst the outside was charred and blackened in creole spices, it remained tender and juicy within. My friend had this, but with bream, last week and said it was, and I quote; ‘AMAZING, just amazing!!!’. 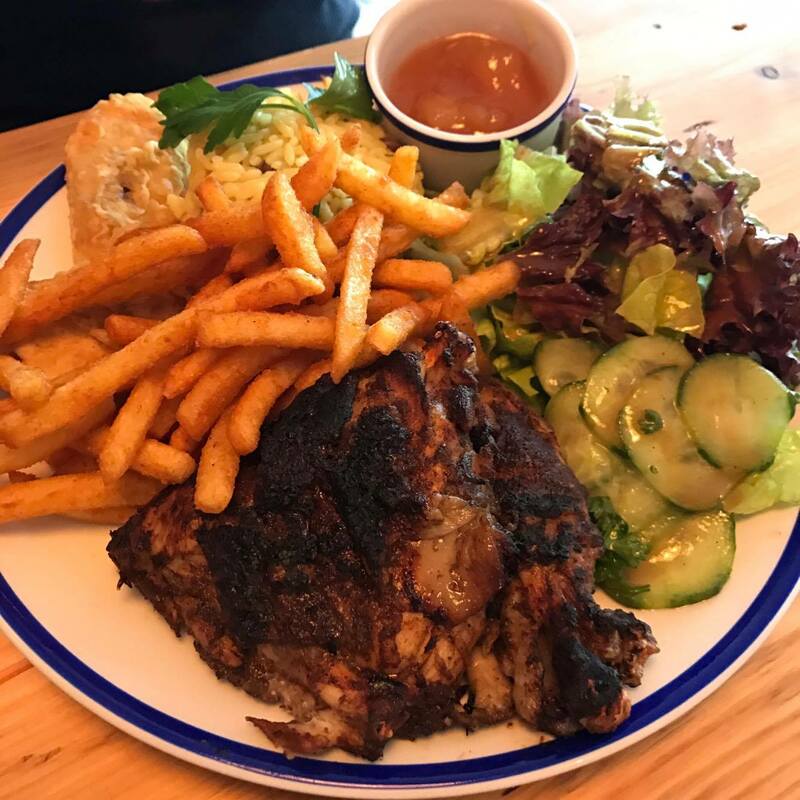 So yes, Caribbean food-loving pescetarians of Brighton can rejoice. 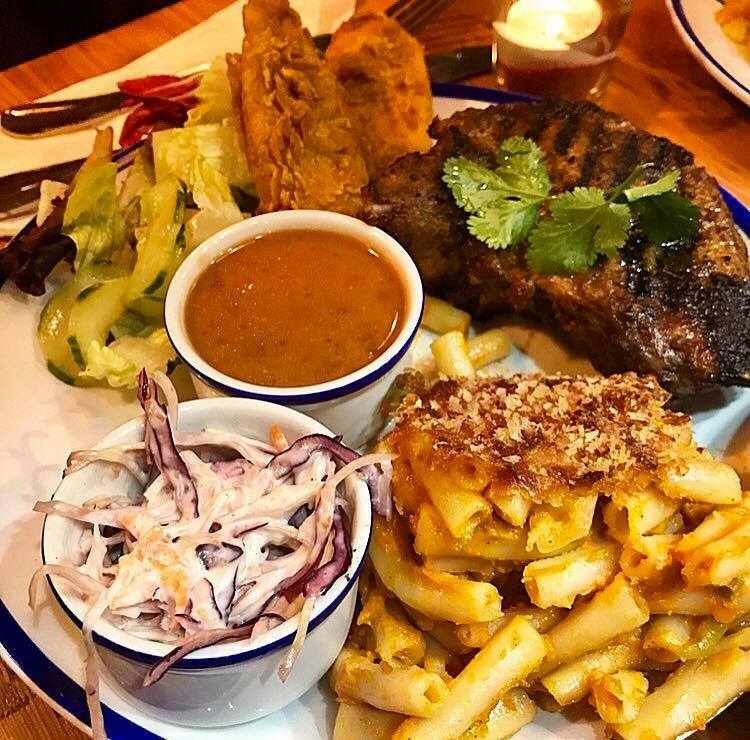 Chicken is a staple in this type of cuisine and you can have it in either traditional jerk or fried form (both £10.50 with two sides). 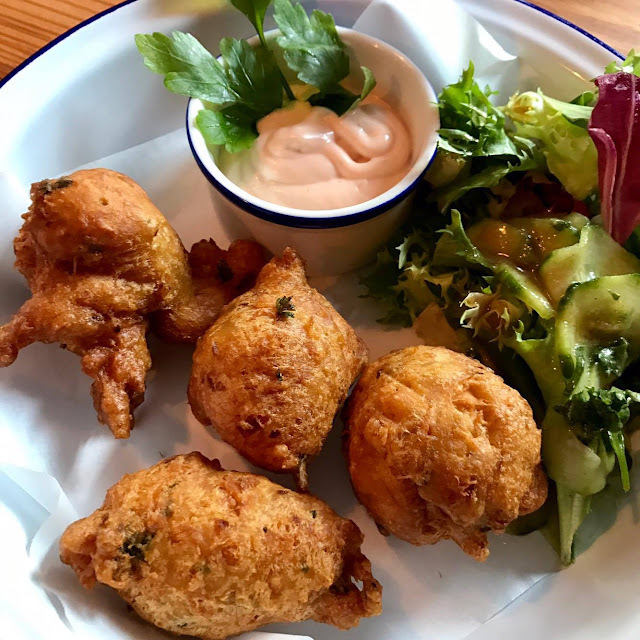 For me, the latter very slightly has the edge, but then I’m just a sucker for battered and fried anything, and this is definitely the best I’ve found in Brighton since The New Club and The Park View pub, both did away with their incredible fried poultry offerings (WHY GOD WHY?!). In terms of sides, I just can’t ever bring myself to order fries, anywhere but pubs or fast food restaurants, (the above were my friend’s, the philistine) and have opted for the Bajan staple; mac pie, on all of my visits. With its crunchy top and kick of heat throughout, it was so far removed from the piles of tasteless stodge I’ve been served from other places in Brighton, I could’ve wept with joy. At £13.50 the pork is one of the priciest main courses, but the chop itself was an absolute beast, just the right side of charcoal and not a hint of the toughness that can happen to this cut of meat, with just a minute too long under the grill – a match made in heaven, with its tangy onion gravy sidekick. More of that gorgeous mac pie, lime-dressed salad and crisp slaw, made for a seriously hefty plate of food. As I’ve been writing this review I’ve been trying to decide which was my favourite of all the mains, my thought process went something a bit like this: ‘Ooooh the swordfish. No wait, the fried chicken, deffo the fried chicken. Oh but the pork was SO good, fuuuuuck. I honestly can’t call it, they’re all good, they’re all fantastic. 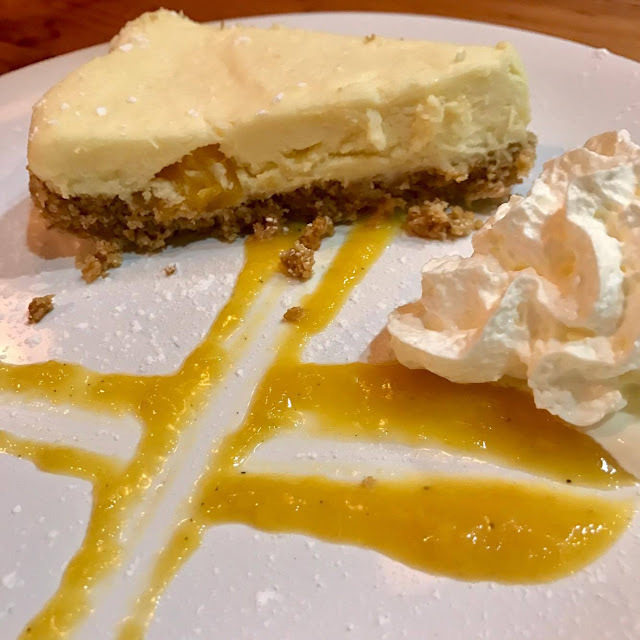 One of the many (honestly, loads) people I’ve recommended Bus Stop to, messaged me during their visit, simply saying ‘YOU HAVE TO TRY THE CHEESECAKE’ – which was recommendation enough for me, and he was right – a fiver will get you a slice of some of the best cheesecake I’ve ever eaten. Definitely save room for some, if you can. 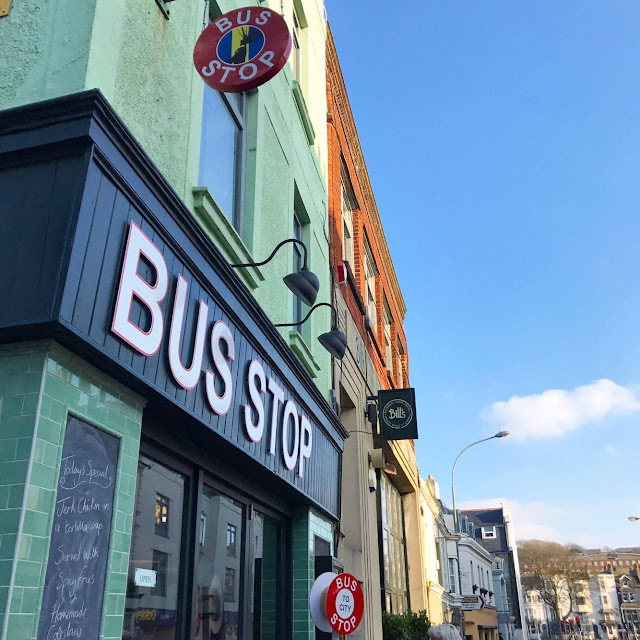 I see a lot of talk online about restaurants failing due to position/high rents/customers’ unreasonable expectations etc etc- this may be true in a very few cases, but Bus Stop have taken a somewhere deemed to be a tricky location and run with it. Great food, lovely service, chilled vibes and a consistently enjoyable experience – anyone looking for a ‘recipe for success’ should take note. 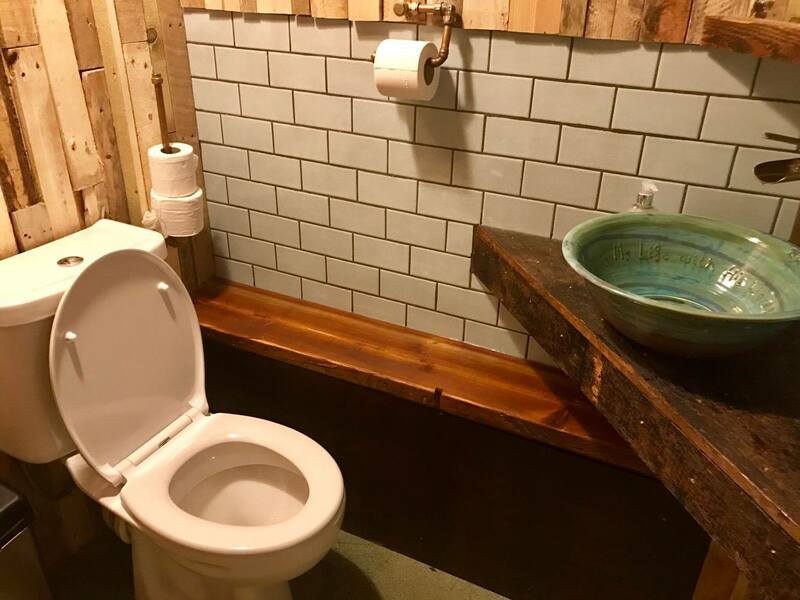 You don’t need a fancy PR company or a massive advertising budget (not that there’s anything wrong with that)- if you offer all of the above, with a sprinkling of social media, then people will come, and tell other people to come. Have you been to Bus Stop? 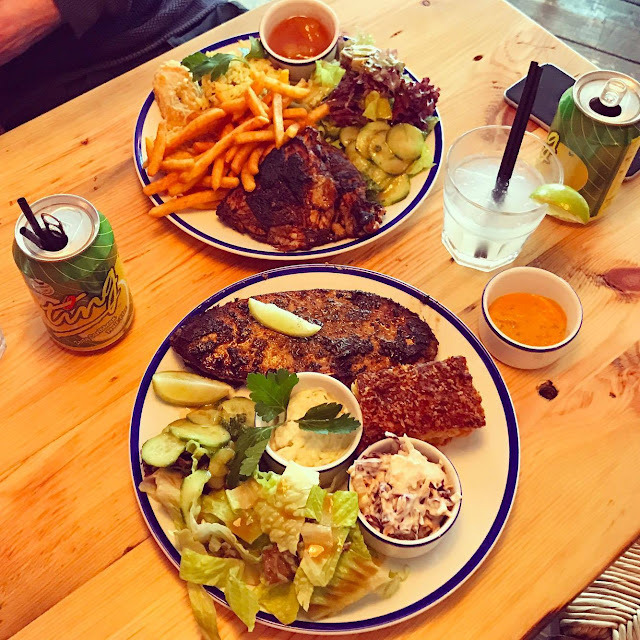 Where’s your favourite place to eat Caribbean food in Brighton? Comment below or hit me up on all manner of social media (links below). Barbados’ loss is Brighton’s gain. The Cornerstone on Elm Grove used to do lovely Caribbean food back in 2009ish; they got bonus points for having decent vegetarian options too. The chef was a sweet old lady who I think retired — although I heard a rumour that she moved to a pub in Hove — and the food took a downturn after that. I’m so glad you mentioned Juke’s! I pass it every day but have never been as was suss about how quiet it was. Will be going this week and trumpeting their name if still good. Cummin Up was recently taken over (and very deep cleaned by the new owner!) so it may be worth giving it another try. Certainly looks a lot less grimy from a passerby’s point of view (I haven’t yet eaten there). Just had to dig through and find this again as we went here last night based pretty much solely on this review and LOVED it. Not the first time that your reviews have helped me make a decision on where to eat and have never been disappointed. Thank you for the consistently fabulous tips! Becky, this comment has made my day, thank you <3 Bus Stop is great! I also highly recommend trying the Greek food truck outside Churchill Square, in particular, the pork gyros or Noodles Soup on West Street - honey pork Singapore laksa and dumplings!